From the mid-1990s to the early 2000s, a series of brutal civil wars tore through the Mano River Basin sub-region of West Africa. Starting in Liberia but soon spreading to Sierra Leone and Côte d’Ivoire, violent conflict ripped societies apart. State authority dissolved, institutions of governance collapsed, millions were forced to flee, and all of West Africa was threatened with destabilization. Then something happened; the world engaged. 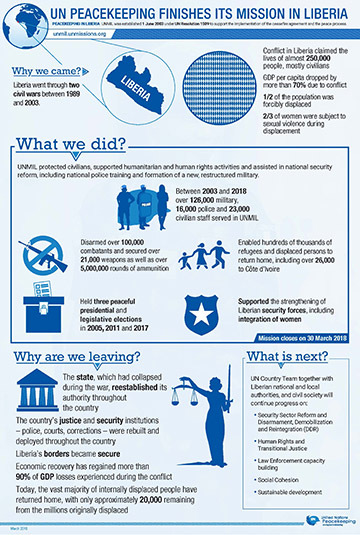 In 1993, the UN Security Council approved the first UN peacekeeping operation in the region with the creation of the United Nations Observer Mission in Liberia (UNOMIL). It was the start of 25 years of peacekeeping presence in the Mano River Basin. The United Nations Observer Mission in Sierra Leone (UNOMSIL) was authorised in 1998, the United Nations Mission in Sierra Leone (UNAMSIL) in 1999, the United Nations Mission in Côte d'Ivoire (MINUCI) and the United Nations Mission in Liberia (UNMIL) in 2003, and finally, the United Nations Operations in Côte d'Ivoire (UNOCI) in 2004. Forces from the Economic Community Organisation of West African States (ECOWAS) also made an invaluable contribution to peace. 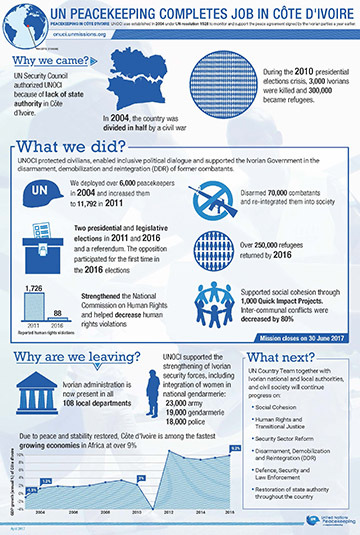 Hundreds of thousands of peacekeepers from the United Nations and neighbouring forces have served across the Mano River Basin between 1993 and 2018. 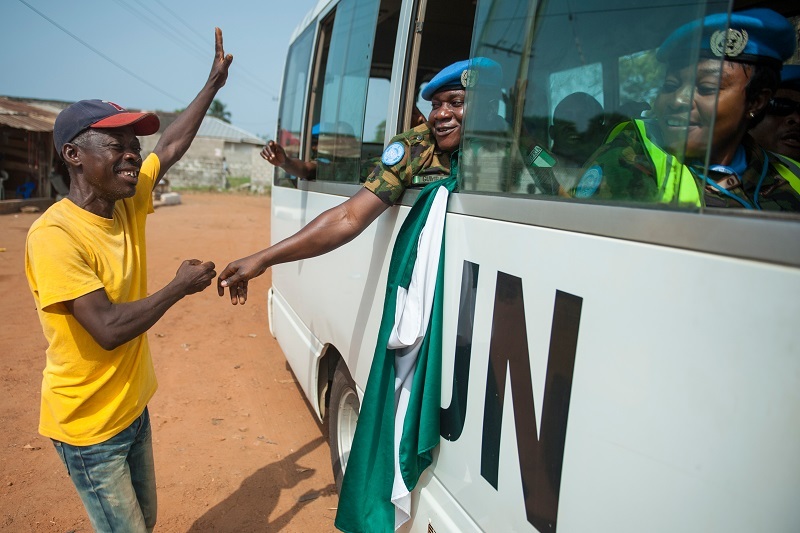 At their peak, the UN missions represented a combined force of approximately 45,000 UN peacekeepers with more than 18,000 in Sierra Leone, 16,000 in Liberia and 11,000 in Côte d’Ivoire. 547 of these brave women and men paid the ultimate price and lost their lives while serving for peace in the sub-region. With the departure of UNMIL in March 2018, UN peacekeeping withdrew from the Mano River Basin, leaving the sub-region at peace with itself and its neighbours and positioned to realize the promise of a brighter future. The six peacekeeping missions that operated in the Mano River Basin between 1993 and 2018 have been central to helping keep the peace, protect civilians, facilitate political processes and give peace a fighting chance in Côte d'Ivoire, Liberia and Sierra Leone. The progress these states have made was further evident in their successful response to the Ebola crisis of 2014, in which the UN served as an important partner. The UN also supported the attribution of justice for millions of victims in the region. Sierra Leone’s Foday Sankoh died awaiting trial by the United Nations-backed Special Court for Sierra Leone, while Liberia’s Charles Taylor is serving a 50-year sentence in the United Kingdom for aiding and abetting war crimes, and Côte d'Ivoire’s Laurent Gbagbo currently faces charges of crimes against humanity at The Hague. The Bronx Documentary Center, in collaboration with Magnum Photos, Getty Images, the United Nations Department of Peacekeeping Operations, the United Nations Foundation, and RISC Training, has organised an exhibit showcasing the work of Tim Hetherington and Chris Hondros. Their powerful photographs played an important role in moving the world to action and ultimately bringing the Liberian conflict to an end. Read the remarks delivered by the Deputy Secretary-General, Amina J. Mohammed, at the opening of the exhibit. Together, these two photographers alerted the world to Liberia’s tragedy during its civil wars and helped to build the international momentum which resulted in the deployment of a United Nations peacekeeping mission that brought the war to a close, helped set the stage for democratic elections and created a lasting success story for the West African nation. 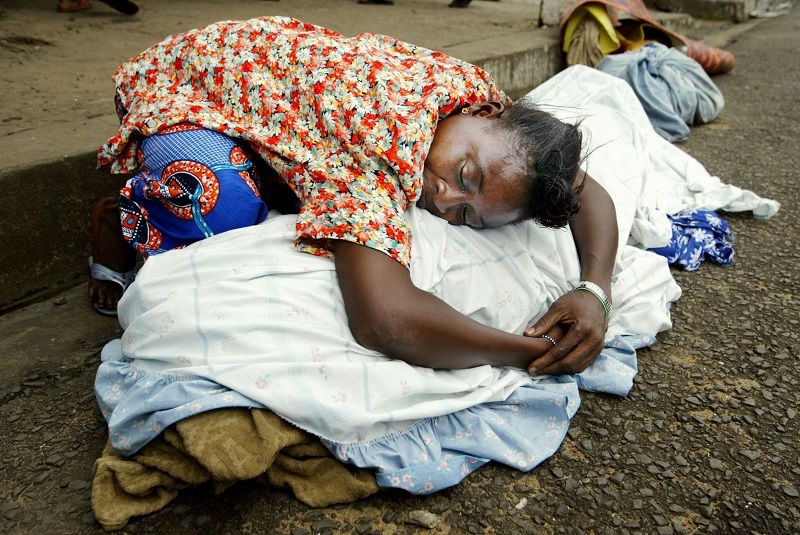 What motivated an international community dispirited by failures in Srebrenica, Rwanda and Somalia and exhausted by large deployments in Kosovo, East Timor and Haiti to send large operations into harm’s way in Liberia, Sierra Leone and Côte d’Ivoire? One reason was the power of the images flowing from those conflicts and spilling out on the front pages and TV screens all over the world. The powerful and compelling pictures helped the UN to advocate with member states and provoked outrage which in turn helped to galvanize governments all over the world into action. Some of the best photojournalists on the planet made sure that the world would see — really see — what was going on as the sub-region slid into anarchy. They did so at great personal risk, and sometimes, at great personal cost. Images captured on the ground in those horrible conflicts personalized a story all-too-easy to dismiss as distant, insoluble and incomprehensible. Suddenly it wasn’t just another bloody conflict in Africa, it was real, it was immediate, and it was human. Photography helped pivot the story from a far-off tale of inhuman savagery to one of humanity, our humanity, in peril. Peacekeepers helped to stabilize, restore and protect, but they would not have deployed without the international community’s political commitment, and that was informed and shaped by the photographs and video taken on the ground. The exhibition is on view from 26 October until 13 January 2019 at the Bronx Documentary Center St Mary's: 364 E. 151st Street, Bronx, New York City. UN Peacekeeping has graciously received the rights to feature this song by Alpha Blondy Production in support of this campaign. 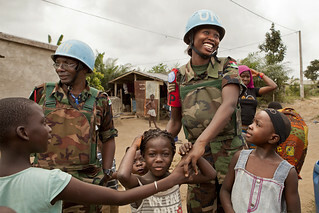 The United Nations peacekeeping mission in Liberia has come to a close after fifteen years leaving a legacy of peace.